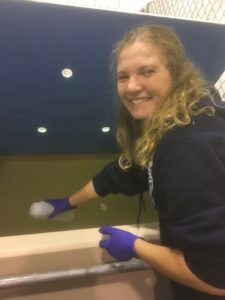 Emma Newcomb has spent this semester conducting research on the cases in our state-wide marine mammal stranding database that involve human interaction with seals. This work is part of our current NOAA Prescott grant-sponsored research and Emma’s role in the research is supported by an award from the Center for Undergraduate Research. Emma’s research was recently featured by UMaine in a series on ongoing undergraduate research leading up to our annual UMaine Student Symposium. Check out her video, produced by Cammen Lab member, Holland Haverkamp. Season’s greetings and Happy New Year from the Cammen lab! Check out UMaine’s season’s greetings video, featuring our very own Alayna Hawkins (at 0:42 into the video), in a photo taken by our very own Holland Haverkamp. It’s great to see our students representing what lab work can look like at the University of Maine. Best wishes to all for a happy, healthy, and productive 2019! Check out the latest issues of NOAA Fisheries Science Connect, which features our recent publication in Ecology and Evolution. Science Connect highlights the latest publications focused on protected species science. 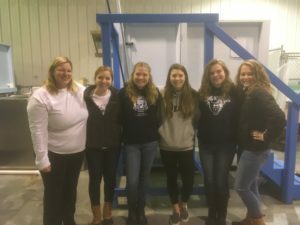 (left to right) Lynda Doughty, Alayna Hawkins, Sarah Burton, Shannon Brown, Emma Newcomb, and Emma Spies at the Marine Mammals of Maine triage facility in Harpswell, ME. Lynda Doughty, executive director and stranding coordinator, of Marine Mammals of Maine hosted a visit of several of our lab members to MMoME’s seal triage and rehabilitation center this past weekend. This was a particularly exciting visit for our students who have hours and hours of experience working with marine mammal stranding data in our custom-built electronic database, and our students who spend most of their time at a lab bench working with seal DNA. Lynda gave us a tour of the facility and shared stories and lessons learned from the past several months of crisis response to a federally-designated Unusual Mortality Event that more than tripled the number of seals they were called to respond to, compared to previous years. We talked about several ways to strengthen our partnership between the University of Maine and MMoME, with a particular focus on how students can be involved. To support one ongoing research collaboration, we also collected a water sample from a seal rehab pool for continued eDNA (environmental DNA) method development. Thank you, Lynda, for hosting our visit! Sarah Burton collects a water sample for eDNA analysis. Emma Newcomb, a 2018 SEA Fellow and Cammen Lab undergraduate research assistant, presented her research at a public, student-focused symposium held at the Darling Marine Center in Walpole, Maine earlier this week. The symposium was attended by >80 scientists, industry and community members, and the interested general public. 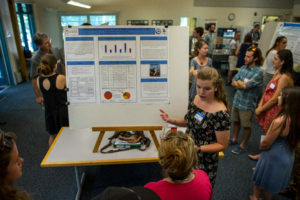 Over 20 undergraduate students presented posters about their summer research experience, all linked by a shared goal to improve our understanding of the Maine’s coastal ecosystem to help benefit our coastal communities and economies. You can read more about the 2018 SEA Fellows Symposium here. Emma’s research focused on classifying and quantifying marine mammal-human interaction cases that are observed in Maine and recorded by our collaborating stranding organizations, Marine Mammals of Maine and Allied Whale. Human interaction cases are currently categorized nationally as boat collision, gunshot, fisheries interaction, and “other”, and we are working to further describe this hard-to-define “other” category, which is this the most common type of human interaction for our stranded marine mammals in Maine. These interactions are normally typified by a human approach within 150 yards and oftentimes referred to as marine mammal harassment. We would like to acknowledge the University of Maine System’s Research Reinvestment Fund (RRF) for their support of Emma’s summer research experience, part of an Interdisciplinary Undergraduate Research Collaborative grant. Emma will continue her research in this area during the academic year, supported by a NOAA Prescott grant. 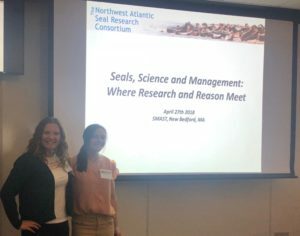 Sarah Vincze and Sarah Burton represented the Cammen Lab at the 2018 Northwest Atlantic Seal Research Consortium (NASRC) Meeting. Sarah Vincze was invited to give an oral presentation on our recently published paper, Genetic Diversity from Pre-bottleneck to Recovery in Sympatric Pinnipeds in the Northwest Atlantic. Faythe Goins receives Highest Honors! Congratulations to Faythe Goins, who publicly defended her undergraduate Honors thesis research this afternoon in front of friends, family, academic colleagues, and the entire UMaine women’s softball team! 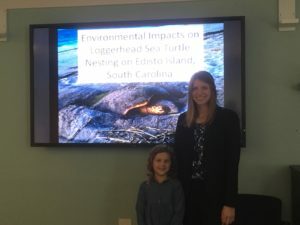 Faythe studied how environmental factors, such as temperature, cloud cover, and precipitation, have affected loggerhead sea turtle nesting on Edisto Island, SC over the past 8 years. In addition to her research, Faythe presented a reading list of books, texts, and musical pieces that have been important to her throughout her college career. For her excellent thesis and presentation, Faythe earned Highest Honors! Faythe’s analysis relied on long-term data collected by volunteers for the SC Department of Natural Resources, a program which Faythe herself has participated over the past 4 summers. 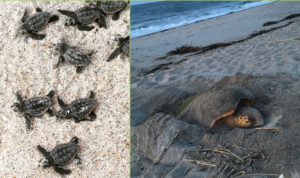 Faythe is excited to spend one more summer on sea turtle patrol in SC before heading to the University of Georgia Veterinary School this fall.